Facebook And INQ: Married, In A Relationship, Or It's Complicated? This whole Facebook Phone thing just keeps getting weirder and weirder. Okay fine, misunderstanding, miscommunication, whatever. But tonight brings another new report about the project. This time, Bloomberg is reporting that Facebook is working with INQ Mobile on two smartphones that will first hit Europe, and then come to the U.S. to potentially be sold through AT&T. These phones are believed to run on Google’s Android operating system, but likely a modified version with deeper Facebook integration. […] different people come to us with different ideas all the time, and we mentioned the example of the INQ phone in the past, and I think you appropriately said that it isn’t some massive big thing, and the reality is we don’t think it is a massive big thing either, but it is cool and actually a lot of people bought it. Interestingly, a lot of this stuff, we don’t even do the engineering work. 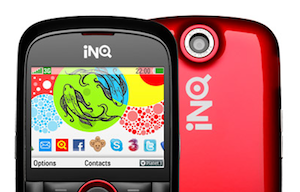 The INQ phone, I don’t think we had any engineers work on it. We’ve been working with INQ for a couple of years now to help them build a deeply integrated Facebook experience on their devices. So if it’s not engineers, which team exactly is working with INQ on these phones? Just the marketing department? Just the team that does deals? Or perhaps Zuckerberg was just refering to the INQ1, and these newer INQ phones will be different — but it sure doesn’t sound like that. The quest to find the Facebook Phone continues — perhaps even inside Facebook itself.